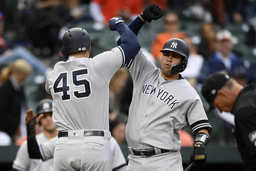 BALTIMORE (AP) Gleyber Torres and the New York Yankees finally put the bat on the ball in a huge way, and the result was a satisfying victory that wrecked the Baltimore Orioles' home opener. "It was nice today to break through with a couple of big hits - big hits that happened to be home runs," manager Aaron Boone said. "That really energized the guys and, in a way, allowed us to exhale a bit." It was the third career two-homer game for the 22-year-old Torres, who did it twice last year during his rookie season. The second time was in August against Baltimore, when he went deep against Alex Cobb and Wright - just as he did on this occasion.